Categorized as: Girls & women, Grantmaking strategy, Poverty Alleviation, Stories & Tagged as: Gender issues, Hillary Clinton, Jimmy Carter, Root Capital, Sheryl Sandberg, Stanford Social Innovation Review, Village Capital on September 13, 2014. 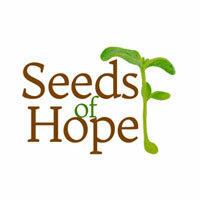 Editor’s note: The Skees Family Foundation’s mission is to extend opportunity for all, primarily in education and enterprise, to end poverty worldwide. We mean opportunity for ALL: women, men, children, and everyone in-between. However, we found this article by Sarah Kaplan and Jackie VenderBrug appealing in its insistence that “investing with a gender lens” brings both men and women into the conversation and results in more healthy, holistic economic systems. Additionally, they argue, if women have access to capital, workplace equity, and products and services they need, the entire community benefits. This is not about bemoaning past imbalances; it’s about economic logic that will advance prosperity and opportunity for all. This article originally appeared on Stanford Social Innovation Review. What do we mean by “lens”? A lens allows us to see the world differently. Looking through a “gender lens” helps investors gain new perspectives, highlight poorly understood inequalities, uncover new opportunities, identify blockages in the system, and find value where none was found before. Why “gender” and not “women”? Although it is focused on the impact of investing on women and girls, the movement uses the term “gender” to emphasize that making change means looking at the socially constructed roles, relationships, and expectations of women and men and the ways that these are reinforced by educational, political, economic, and cultural systems.3 Using “gender” brings both men and women into the conversation. The movement’s objective is to look at the entire financial and social system, not just at women. To understand how a gender lens can change the way investment decisions are made, consider the example of Root Capital, a nonprofit agricultural lender focused on increasing rural prosperity in Latin America and Africa. Root Capital invests in businesses that are too big for microfinance but are unable to get credit from banks—what the organization calls the “missing middle” of finance. They not only lend capital but also offer financial training to help farmers and agricultural businesses access markets. Root Capital did not start with a gender focus, but in the course of its work the organization learned about the challenges women face in accessing resources like credit, land, training, and agricultural inputs. A gender lens became a starting point for exploring new opportunities for action. Root Capital launched a Women in Agriculture Initiative based on the belief that gender-inclusive businesses—rated by a potential client’s percentage of women leaders, women managers, women employees, and women suppliers, as well as inclusive programs and culture—can create greater financial and social impact. 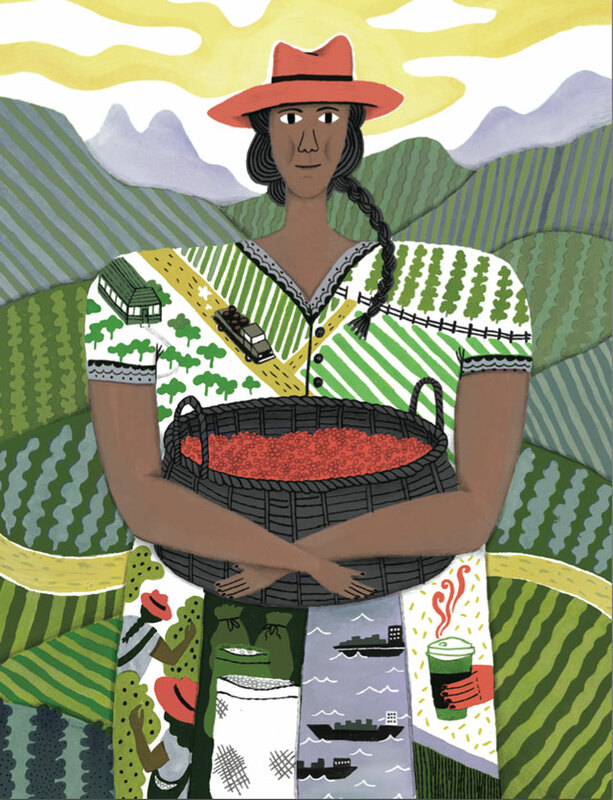 Through a gender analysis, Root Capital found that effective investment in agriculture requires attention to the whole social system, from enabling land ownership for women farmers to empowering middle managers (often women) who are the hidden influencers in small agricultural enterprises, to training entrepreneurs in financial management. A gender lens led Root Capital to identify businesses in traditionally male-dominated industries that have a high impact on women, such as a Nicaraguan collective of women coffee farmers that launched the “Las Hermanas” brand of coffee. It also led Root Capital to focus more on female-dominated but sometimes neglected industries such as shea butter. As a result, a gender lens has expanded, not limited, the range of products and services the lender offers and the types of clients it serves. Although there is increasing discussion of the role of women in organizations and in the larger economy, the tenor of the conversation has been more about how women can learn to operate within the existing system than about how to overcome structural barriers. Sandberg’s Lean In, for example, has been criticized for not taking into account what happens when organizations push back. The breast cancer awareness campaigns that cobrand “pink” products have been criticized for benefiting marketers more than women with cancer. We are not saying that women should not lean in or that people should not buy pink products. We are now at the point, however, where we need to go beyond these individualistic concepts. We must engage trillions of dollars of investment capital to capture the gains that come from paying attention to the systemic problem of devaluing women. Investing with a gender lens is about creating a new economic logic that bridges the market logic of financial returns with the feminist logic of women’s equality. Traditional investors often fear that a focus on women may make them too pink, and traditional advocates for women’s rights often fear that engaging with investors may mean they are selling out. Gender lens investing builds a bridge between these two worlds. It is not about investing in women as if they were commodities, nor abandoning feminism (with its roots in anti-capitalism). Rather, the movement promotes gender analysis as a way of reshaping the system to change what we value as we invest. Paying attention to gender is not just about having a social conscience, nor is it about adding to our list of environmental, social, and governance investment screens. Instead, gender capitalism is about applying a gender lens to highlight the ways that gender is material to financial outcomes and financial outcomes are material to gender. There is, however, no universal approach to investing with a gender lens. There are important distinctions between resource rich and resource poor settings, between different regions and countries, between different economies, and between different investment products. The ideas and examples in this article are meant as starting points for a larger conversation about how seeing through a gender lens can improve the financial and social returns of investments. We focus on three ways that a gender lens can serve this function. The first is gaining access to capital—getting women involved as investors and investees, from Silicon Valley to Bangladesh. The second is promoting workplace equity—using capital to value gender diversity in leadership and promote equal rights throughout company value chains, from top management to the shop floor. 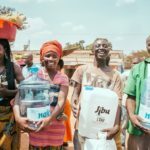 The third is creating products and services that affect the lives of women and girls, from clean cookstoves in Africa to pharmaceuticals that have been tested on women and adjusted for them. These three approaches are neither exhaustive nor exclusive. Instead, they are useful analytically in identifying opportunities and uncovering barriers to progress. As the Root Capital example shows, investors may use multiple lenses simultaneously. When we look through a gender lens, disparities between men and women’s ability to access capital become quickly apparent. Across all industries—from retailers, to filmmakers, to high-tech entrepreneurs—women have historically had trouble gaining access to investment capital, despite evidence that women-led companies may deliver higher and more consistent returns.4 In addition, there are few women in the business of investing money (in banks, venture capital firms, or hedge funds, for example), which compounds the problem, especially given the tendency for people to invest in and mentor people like themselves. Innovative investors are breaking these patterns. 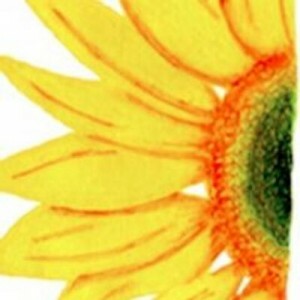 Consider Village Capital, an organization developing and funding innovative social enterprises. Finding that the traditional due diligence process was expensive and not terribly effective, Village Capital created a peer mentoring and peer selection approach that would, in their words, “democratize the entrepreneurial process.” They select cohorts of about 15 entrepreneurs in specific geographic areas and industries for a 12-week program based on peer mentoring. Village Capital commits to providing funding to the top two enterprises, which are selected on the basis of peer evaluations. The program was not specifically designed to enhance female entrepreneurs’ success, but Village Capital found that although only 15 percent of the participating companies had female co-founders, these companies represented 40 percent of the investment winners. Female co-founders have been 2.7 times more likely to get funding through this model, and the differential has increased as Village Capital has improved the structure and transparency of the programs. “There are systematic, implicit biases that investors have in the traditional venture world that many don’t even recognize and that disproportionately favor men. When you are more structured, methodical, and transparent and your assumptions are things you have to back up, women-run ventures tend to be appropriately valued,” says Ross Baird, executive director of Village Capital. The opportunities to rethink investment processes are not limited to incubators and accelerators. The 2013 launch by the International Finance Corporation (IFC) of a “Women’s Bond” has created new legitimacy for focusing on women’s access to capital. About $175 million has already been committed by the IFC to banks such as Itaù, the largest bank in Brazil, for investments in women-owned businesses. With women starting ventures at unprecedented rates, we are likely to see more innovations like this.7 Women-focused crowdfunding platforms such as Portfolia, gender-aware venture capital firms such as Illuminate Ventures, regionally focused investment funds like Texas Women Ventures, and nonprofit intermediaries such as Agora all provide investors with access to compelling opportunities. Grasping how definitions of “merit” may embed criteria biased against women can open investors’ eyes to new opportunities. For instance, Illuminate Ventures deliberately recruits women advisors and investors, putting it into a different deal flow from other venture capital firms. The result: About half the companies in Illuminate’s portfolio have female co-founders, a share that is dramatically above the industry average of 6 percent.9 New opportunities also present themselves when investors expand the definition of what type of business constitutes a good investment. For example, women disproportionately start businesses that aim for steady profit rather than rapid growth or a quick and rich exit. Broadening one’s definition of an entrepreneur to include the woman filmmaker in Hollywood and the woman coffee farmer in Nicaragua (along with leaders of Silicon Valley high tech startups), also expands the set of investment opportunities. Investors are beginning to see financial opportunities in taking gender into consideration. The Women and Girls Equality Strategy (WGES) is an investment approach developed by U.S. Trust in collaboration with the Women’s Foundation of California. The foundation was eager to advance its mission—the economic security of women and girls—through its investments in addition to its grantmaking. Operating in a fiduciary environment where investments must comply with “prudent investor” laws that mandate judicious choices about the tradeoffs between risk and return, the foundation also needed to maintain market rate returns. “We wanted to align our investments with our values, and also to use a gender lens to identify smart investments in companies we’re proud to own,” says Judy Patrick, CEO of the Women’s Foundation of California. U.S. Trust (which employs one of us) leveraged its Socially Innovative Investing platform to create a strategy that looks holistically at how companies engage women—as consumers, employees, and agents of global change. One important metric that investors are beginning to use is the number of women on boards of directors. For example, Morgan Stanley’s Parity Portfolio uses this number as an investment screen. The WGES approach adds other metrics to analyze how gender equity plays out throughout the organization. WGES examines quantitative criteria to compare companies with sector peers on factors such as pay equity; recruiting, retaining, and promoting women; supply chain and subcontractor relationships; gender impact of goods and services; and portrayal of women in media. The strategy considers both policy and practice; for example, the existence of policies for inclusive hiring as well as the track record of payments for discrimination lawsuits. The goals of gender-focused investment vehicles are both to generate returns and to use the power of these investments to help push companies toward gender equity. Several trends point to the increased value of using a gender lens to look across an entire value chain. Take education: As women are increasingly educated, investors must consider which firms will win the war for talent. Governments like that of Japanese Prime Minister Shinzo Abe are seeing the economic benefit of women in the workforce and are establishing incentives for corporations that excel in gender diversity. Coca Cola has embarked on an ambitious campaign, called the 5×20 program (the goal is to empower 5 million women entrepreneurs across Coca Cola’s value chain by 2020), to leverage women’s participation throughout its business.13 The Calvert Foundation, a social investing intermediary, found that the process of launching the pioneering Women Investing in Women fund (a gender-focused investment vehicle) energized its staff and created new client relationships and opportunities. Including gender equity in investment evaluation metrics drives transformative conversations about realities inside and outside organizations. To date, organizations have relied on important, but crude, measures such as counting the number of women at various levels of management. If counting continues to predominate, it risks provoking the backlash of tokenism. Using a gender lens on workplace equity broadens the questions to recognize other dynamics. For example, understanding the gendered context in which people operate—such as research demonstrating that women can be either likable or competent but not both, or that in some cases domestic violence can increase when women’s income increases—helps leaders innovate more effectively. 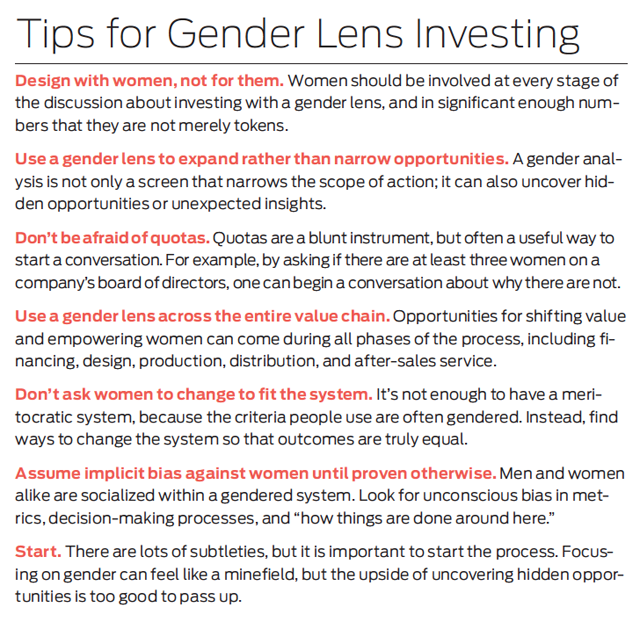 The approach of the gender lens investing movement is different. The goal is to create opportunities and reduce risks by designing products and services (and their value chains) that empower women and girls and improve their lives. This means changing the design process from designing for women to designing with women. It is not about taking products and making them pink. Successes in producing clean cookstoves, in reducing infant mortality, in improving feminine hygiene, and in other areas come from collaborative innovation. The Global Alliance for Clean Cookstoves is demonstrating the power of investing in products for women. Clean cookstoves and fuels can improve health outcomes related to emphysema, cataracts, and heart disease as well as alleviate economic burdens that disproportionately fall on women and girls. The organization now has more than 1,000 partners working to build a global market for clean cookstoves and fuels. What they have found, however, is that adoption of the new cookstoves has been spotty. Some of the challenge lies in designs that do not fit the needs of the women: They are engineering solutions from companies mainly in developed economies delivering products to people in resource-poor environments. Several lessons can be drawn from these three different approaches that will help investors use a gender lens to guide their decisions. The first is that systems matter. For investors, it is easy to focus on the specific investments without thinking of the systems in which they are embedded. For example, when microfinance works for women, it is not just because of the loans, but also because of the entire set of principles and programs that have been created to support women entrepreneurs. 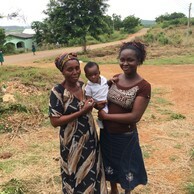 When the loan comes with technical assistance, a commitment by the women to have a different relationship with their husbands, and a loan compact that includes support groups, results improve. Similarly, encouraging women entrepreneurs anywhere in the world without confronting the biases in the entire funding system will not increase the number of women-owned businesses. Using a gender lens is about changing processes, not simply working within them. The second lesson to be learned about gender lens investing is that metrics are important for creating incentives and for tracking progress, but our current methods are often not sophisticated enough to measure all that is important. Counting the number of women—on corporate boards of directors, in hedge funds—is a good start, but it is not enough. Asking about metrics, collecting data, and reporting the results trigger dialogue and actions to reduce inequities and uncover opportunities, but creating metrics that can reveal systemic issues is hard. As University of Oxford professor Linda Scott and her colleagues show in their three-year field study of Avon resellers in South Africa, we cannot understand the impact of women’s entrepreneurship until we define success according to the criteria of the women themselves.17 There, key outcomes not often measured in studies of microfinance were changes in self-perception, improvements in self-confidence, and development of expertise that the women experienced. The third lesson for gender lens investing is that women must be at the table in all of these conversations, and in adequate numbers. As Christine Lagarde, then France’s Finance Minister, famously said, “If Lehman Brothers had been ‘Lehman Sisters,’ today’s economic crisis clearly would look quite different.”18 A token woman on a panel or on a leadership team does not make for effective representation. (In fact, research shows that tokenism can often be worse.19) This cannot be a women-only conversation. We are all implicated in the current gendered systems of capital allocation, and the only way out is for everyone to see the world through gender lenses. The important question we must now answer is how to move gender lens investing from the fringe to the center of the discussion. The sustainability movement took years to be taken seriously but has now entered the mainstream with thematic investment funds attracting assets and corporations like Wal-Mart Stores producing sustainability reports and being asked by their shareholders to address environmental, social, and governmental issues. As we reflect on what it will take to build the field, we see three immediate barriers as well as some openings that make us optimistic. First, there are not enough investment vehicles that leverage a gender lens. One fix for this deficiency is for investors to demand access to these types of investments. This can be a virtuous or vicious cycle: Without demand, supply will be suppressed, but greater demand can instigate innovation. A quicker fix is for investment managers to add gender metrics to their existing analyses. Second, we lack the data needed to design smart investments. We have to get to the point where gender-disaggregated data is a de rigueur consideration when making investments. And we need different kinds of data that support gender analyses (such as the surveys that EDGE is now doing). Some of these data should include case studies that can show how investing with a gender lens can be done. More data will create both the “proof points” to justify action and the “signposts” for those who want to act. Third, concurrent with the development of data, the field needs to develop expertise in bridging the two domains of gender and finance. Investors and financial institutions need skills in doing a gender analysis. Women’s empowerment organizations would benefit from expertise in using finance as a tool in the toolkit. Today, few people can speak both languages, and few organizations know how to make the connections. Building the field will be essentially about finding ways to build these forms of expertise. The financial crisis from which we are just emerging has caused many people to question the foundations of the existing system. Moments of crisis can create opportunities for systems change. Can a gender lens help us move forward from the current upheaval in financial markets and the broader economic crisis? Given the increasing attention to women and the economy, can a gender lens on investing offer tangible solutions for making progress? This content represents the thoughts of the authors and does not necessarily represent the position of Bank of America or U.S. Trust. Always consult with your independent attorney, tax advisor, investment manager, and insurance agent for final recommendations and before changing or implementing any financial, tax, or estate planning strategy. U.S. Trust operates through Bank of America, N.A., and other subsidiaries of Bank of America Corporation. Bank of America, N.A., member FDIC. Investment products are not FDIC insured, are not bank guaranteed, and may lose value. 2 Giving Credit Where It Is Due, Global Markets Institute, Goldman Sachs, Feb. 2014.
files/2012/08/The-Gender-Handbook-for-Investors.pdf, accessed June 24, 2014. Financial+Markets/MSME+Finance/Banking+on+Women/, accessed June 24, 2014. 9 Illuminate Ventures, 2012, http://www.illuminate.com/, accessed June 24, 2014.
womenonboards/factsheet-general-1_en.pdf, accessed June 24, 2014.
of Human Groups,” Science, Oct. 2010, 330 (6004): 686-688.
index of US stocks that includes all stocks in the S&P 500, S&P 400, and S&P 600. 13 See http://www.coca-colacompany.com/stories/5by20/infographic-5by20-by-the-numbers for an overview of the process and results of this value chain review as of 2014.
edge-cert.org/userfiles/file/Press%20release_28_10_2013.pdf, accessed June 24, 2014. 15 Paula A. Johnson, Therese Fitzgerald, Alina Salganicoff, Susan F. Wood, and Jill M.
Services/womenshealth/ConnorsCenter/Policy/ConnorsReportFINAL.pdf16 Global Alliance for Clean Cookstoves, “Gender Guide,” http://www.cleancookstoves. org/our-work/gender-guide.html, accessed June 24, 2014. Theory and Practice, May 2012, 36(3): 543-568. 18 “Lagarde: What If It Had Been Lehman Sisters?” The New York Times, May 11, 2010. Jackie VanderBrug is a senior vice president and investment strategist at U.S. Trust. She was previously managing director of Criterion Ventures, an organization promoting investing with a gender lens. Images from original article. Cover photo by Suzanne Skees.